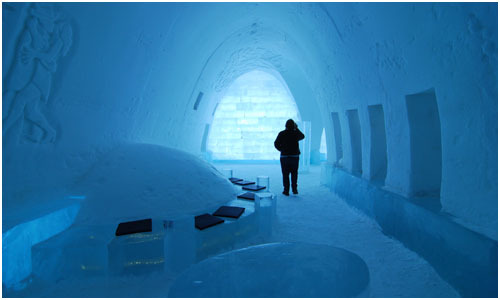 Here is some additional Q&A with Sofi on the ICEHOTEL, as well as the well-known ICEBAR! 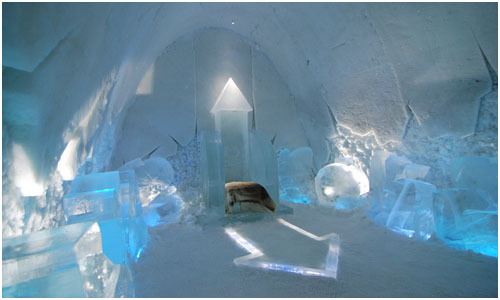 Tell me about the ICEHOTEL and art? How do you select the designs behind each suite? Each year, a jury consisting of members of the Art & Design Group review the submitted designs. 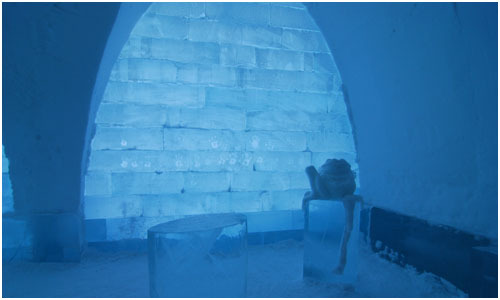 We’re actually about to open the submission process for next year’s ICEHOTEL. So how long does it take to complete a suite? Each designer has 19 days to complete the suite. 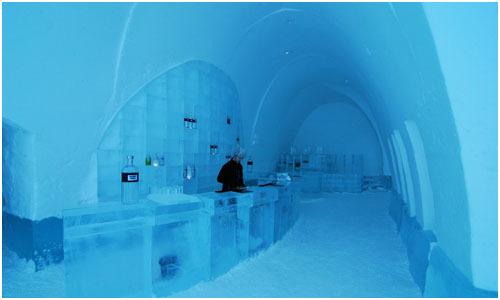 The interesting thing to note is that half of the designers have never worked with ice before! 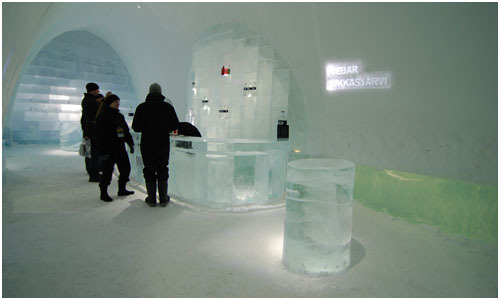 Tell us a bit about this year’s ICEBAR here at the ICEHOTEL. 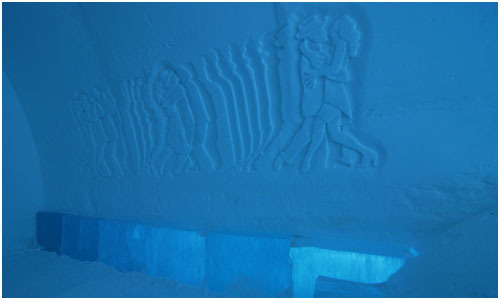 This year’s ICEBAR has a dancing theme called “It Takes Two to Tango”. The room has many ovals from the arches to the room itself and the bars and seating areas. There are depictions of couples doing the tango, and if you look up, you’ll even see that some of the dancing has gone up to the ceiling! This is a play on a Swedish saying to “hit the heels on the roof” (slå klackarna i taket). 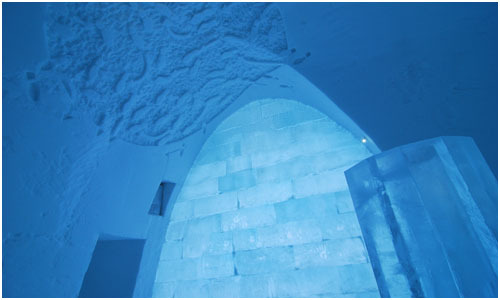 The ICEHOTEL will remain open until the end of April. This year the ICEHOTEL will be open again during summer, featuring 3 Art Suites, an ICEBAR and more – during the season of the midnight sun. All of this is housed inside the Art Center. How to get there: Fly to Kiruna, Sweden via Stockholm or London, and the town of Jukkasjärvi is only 14km away. 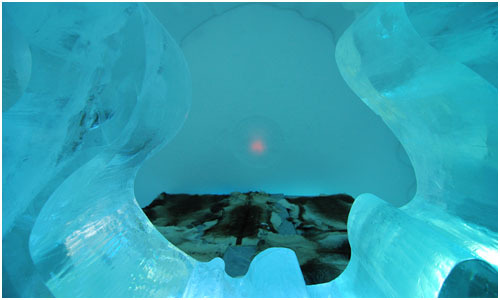 Find more information on the ICEHOTEL’s website. 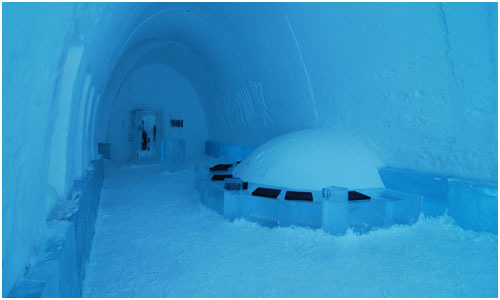 Disclosure: the ICEHOTEL provided accommodations and transportation for the writing of this story. There is no other consideration provided.